Remember Blackberry? QWERTY keyboards, BBIM, BUSINESS. They're back with a new smartphone, and according to them, it's the most secure Android phone, ever. It's called the DTEK50 (not sure why), and it packs some pretty complicated sounding security tech we've never heard of. There's Rapid Security Patching and a DTEK app to keep things updated and secure. It also has a "Hardware Root of Trust" which sounds like something from Dungeon and Dragons. Apparently, "BlackBerry's manufacturing process uses a proprietary technique that adds security from the start, allowing for the tracking, verification and provisioning of DTEK50"
We're pretty sure that's completely meaningless. It also packs Secure Boot Process, Android OS Hardening (make your own jokes about that one) andFIPS 140-2 Compliant Full Disk Encryption. This looks to put it in direct competition with the much more expensive Sirin Labs Solarin,launched earlier in the year. Specs that most of uscan relate to includea 5.2-inch HD screen, 13MP camera, Snapdragon 617 octa-core processor, 3GB RAM, 16GB expandable storage, and 2610mAh battery. There's also the typical Blackberry software additions, such as the Blackberry Hub (a unified inbox) and Intelligent Onscreen Keyboard. 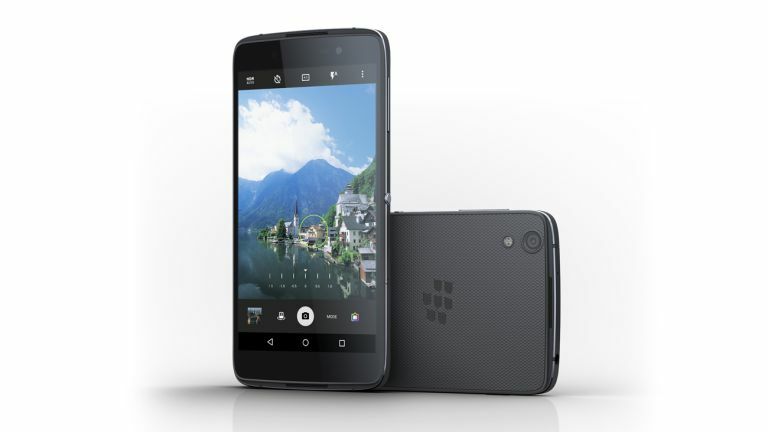 The Blackberry DTEK50 costs a very reasonable £275. Think Blackberry are onto a winner here, or do you still want a physical keyboard? Let us know on Facebook.